Manual Lymphatic Drainage [MLD] is an unique, gentle type of skin massage technique that promotes lymph to drain out of a limb into an area that drains normally. It is mainly used for lymphoedema. 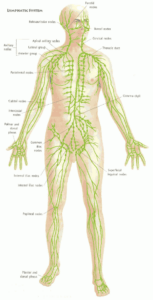 In addition to improving lymphatic circulation, MLD also increases blood flow in deep and superficial veins. Apart from promoting healthy lymph drainage, lymphatic massage boasts of other health benefits. Since it stimulates lymph flow, it helps enhance the immune system. By delivering more antigens to the lymph nodes, massage can relieve the symptoms of several diseases, such as sinusitis, bronchitis, tonsillitis and laryngitis. It can also relieve pain. In cases such as fibromyalgia, it can remove the stagnant fluid that can affect pain receptors. It can also reduce muscle spasms, which can also cause wide-scale muscular pain. Lymphatic massage also promotes tissue regeneration. As such, it can help fractures heal easily. More than just fixing your insides, it can augment your physical appearance as well. Since it promotes tissue regeneration, it eliminates the ugly marks associated with surgical incisions, scars, stretch marks and wrinkles are enhanced.